NEW!! Kubota BX23SLSB-R Tractor with swift tach loader and backhoe. Swift-Connect Backhoe - Go from Backhoe To 3-Point Implements Easily and Without Tools: Need to dig a hole or a trench? Think BX23S. 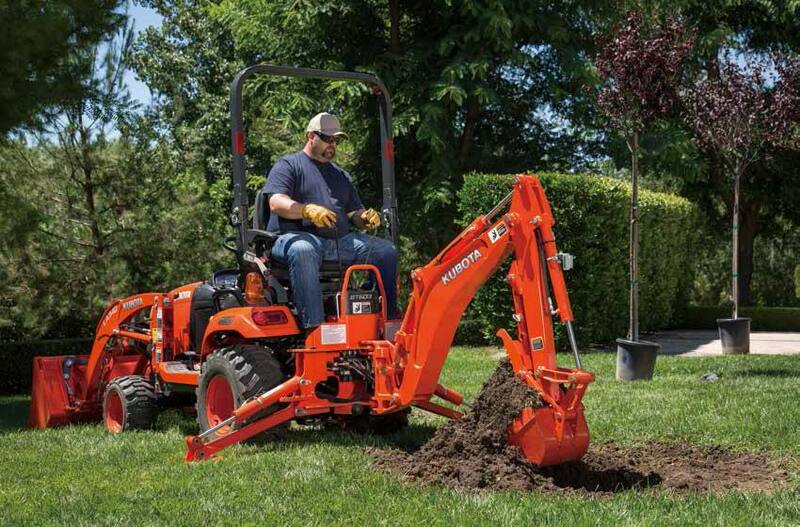 It may be compact, but the BX23S's backhoe offers jumbo-sized convenience and performance. 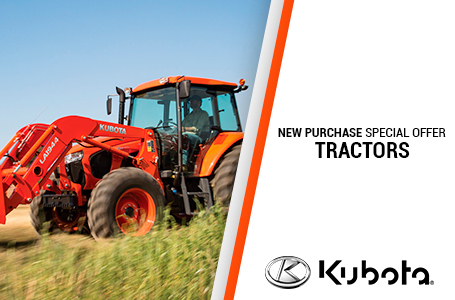 It features the Kubota Swift-Connect mounting system that allows you to change from the backhoe to full 3-point hitch quickly and easily without the use of tools. Additional Features- Reversible Seat - Increases operator comfort by using the existing full size operators seat increasing leg room and comfort; Premium Flat Faced No-spill Hydraulic Couplers - Less mess and easier to connect than traditional tractor hydraulic couplers; Optional Mechanical Thumb - Adding a thumb increases versatility and makes lifting objects even easier; Boom and Swing Cylinder Cushion Valves - Allows for smoother operation (less shock) when using the full range of backhoe movement; Protected Hydraulic Hoses - Reduced maintenance cost due to less hydraulic hose "wear and tear". Swift-Tach Loader - Remove Your Front Loader in Less Than 60 Seconds: Why would you ever want to remove your front end loader? One good reason is that removing the front loader helps prevent ground compaction and turf damage when mowing. It also reduces your turning radius when working in confined areas or around trees. In fact, you'll find that there are plenty of times that removing your front loader will make your job quicker and easier. That's why it's so important that the BX80 series front loader can be removed quickly, without leaving the operators station. Not only is the BX80 front loader easy to remove, it also has the following premium features: Single Lever Hydraulic Connection - Simultaneously attach and detach all four front loader hydraulic lines; Premium Flat Faced No-spill Hydraulic Couplers - Less mess and easier to connect than traditional tractor hydraulic couplers; Curved Boom Design - Allows for better visibility when performing front loader work; Optional 2-Lever Quick Coupler - Easily connect to a wide variety of front loader attachments, such as blades and pallet forks; Optional 3rd Function Valve - For attachments that require hydraulic power such as grapples; Optional Bucket Level Indicator Rod - Helps maintain a level bucket, making material handling even easier. Model shown with options *SAE J1995 **The loader and backhoe come standard on the BX23S model.